When it comes to recruitment, the maritime service of the national defence force can turn to the SA Sea Cadets where young men and women, in addition to seamanship, are exposed to discipline, camaraderie and leadership, making good manpower material for the SA Navy. The SA Army is more reliant on people coming through the military skills development (MSD) programme. This sees some successful volunteers who complete the two year programme taken into the landward force on short-term contracts. The same applies, in even lesser numbers, to the SA Air Force as far as general musterings are concerned. Specialist musterings, including pilots, are handled as such with specific basic skills evaluated by technical panels before actual recruitment. Sadly, the limited numbers taken into the ranks of the men and women who man and support the naval fleet each year mean many sea cadets will not make their way to bridge of, for example, a Valour Class frigate or one of the new inshore patrol vessels (IPVs) currently under construction. “Seamanship is an essential basic skill for all navies and the SA Navy is no different,” Lieutenant Commander Glenn von Zeil, an SA Navy Reserve officer, explained. This skill is generated and honed by, among others, taking part in a 24 hour race recently hosted by Milnerton Aquatic Club. Sea Cadets from TS Woltemade entered a pair of Saldanha dinghies. Under the watchful eye of instructors (four midshipmen) the teams of sea cadets prepared for the endurance event. The Saldanha dinghies are built and fitted by the cadets themselves with guidance from experienced volunteer officers. They are, according to Von Zeil, “versatile working boats used to teach pulling and sailing to sea cadets”. “The aim of the race is to sail a course on the Rietvlei for a 24 hour period. Crew changes are permitted and different sailing conditions experienced as per Cape Town’s weather patterns. Water safety is paramount with life jackets mandatory, rescue boats and NSRI active on the water. “The south-wester on the first afternoon resulted in the race being halted until appropriate dingy sailing conditions returned. 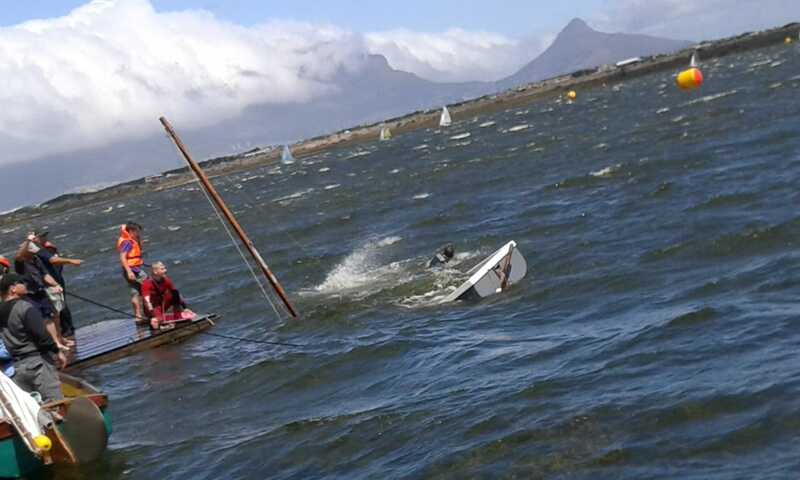 This was after several dinghies capsized including the Sea Cadet Saldanha’s. The TS Woltemade crew put their capsize drill into effect and managed their own safety while directing the dinghies towards the shore. “The crew ashore and rescue boats assisted in recovering both dinghies which added to the practical seamanship experience and teamwork opportunities provided by the MAC24 event. One Saldanha sported a 10 cm hole below the water line after capsizing. No ‘leak stopping or shoring’ sufficed and damage to the mast and rigging resulted in this boat having to withdraw from the race,” Von Zeil said. The excellent seamanship and teamwork displayed at the TS Woltemade Sea Cadets saw them earn the Bootle Bailing trophy for the best team spirit award during the event. There are 14 Sea Cadet units around South Africa with some in land-bound Gauteng and Oudtshoorn and the remainder in coastal cities and towns. Unit strengths range from about 150 for larger ones down to 20 at smaller units. The training, skills and experience Sea Cadets acquire prepares them well for maritime and nautical careers while the discipline factor is a plus if they plant to join the Navy. With only limited numbers taken into the maritime service annually, many Sea Cadets look to the water wing of the SA Police Service (SAPS) or even other SA National Defence Force (SANDF) services. “Many find themselves with either shipping companies or fishing fleets where their understanding of seamanship and discipline makes them valued employees,” Von Zeil said. Two retired Navy officers endorsed Von Zeil’s remarks with one saying “it makes sense to take a person into service when he or she has a good grounding in the basics of what a navy needs”.